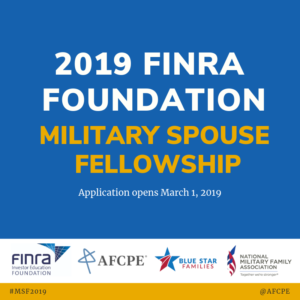 WASHINGTON — Starting today, the FINRA Investor Education Foundation Military Spouse Fellowship is accepting applications for its 2019 class of financial FINRA Fellows — a unique program designed to increase the financial capability of U.S. service members and their families. Applications must be received no later than midnight, EDT, April 19, 2019. Prospective candidates can apply online at http://www.militaryspouseafcpe.org/application. The program is open to current or surviving spouses of active duty or retired Army, Navy, Air Force, Marine Corps, Coast Guard, National Guard or Reserve service members, as well as spouses of members of the U.S. Public Health Service Commissioned Corps and the National Oceanic and Atmospheric Administration Commissioned Officer Corps. The Fellowship is provided by the FINRA Investor Education Foundation in partnership with the Association for Financial Counseling and Planning Education® (AFCPE®), which administers the certification, along with Blue Star Families and the National Military Family Association (NMFA). The FINRA Foundation covers the costs associated with the program’s self-study course and exam. The FINRA Foundation has provided more than 1,530 military spouses the opportunity to earn the AFC® certification. In turn, FINRA Fellows serve the military community of which they are a part. FINRA Fellows pursuing their certification provided financial counseling and education to more than 24,100 service members or their spouses in 2018 alone, and have dedicated more than 475,000 hours helping military families reach their financial goals since the program’s launch in 2006. Upon completion of the AFC® certification, FINRA Fellows continue to support the military community as financial counselors at family readiness and support centers, credit counseling and tax centers, financial aid offices, and credit unions throughout the U.S. and abroad. The FINRA Investor Education Foundation supports innovative research and educational projects that empower underserved Americans with the knowledge, skills and tools to make sound financial decisions throughout life. Since 2006, the Foundation has delivered free, unbiased financial education tools and training to service members, their spouses and military financial educators through on-base educational forums, professional development training programs and online and printed educational resources. A collaborator in the U.S. Department of Defense Financial Readiness Network, the primary goal of the Foundation’s Military Financial Readiness Project is to help military families manage their money with confidence. Learn more at www.SaveAndInvest.org/Military. The National Military Family Association is the leading non-profit dedicated to serving the families who stand behind the uniform. Since 1969, NMFA has worked to strengthen and protect millions of families through its advocacy and programs. NMFA provides spouse scholarships, camps for military kids, and retreats for families reconnecting after deployment and for the families of the wounded, ill, or injured. NMFA serves the families of the currently serving, retired, wounded or fallen members of the Army, Navy, Marine Corps, Air Force, Coast Guard, and Commissioned Corps of the USPHS and NOAA. To get involved or to learn more, visit www.MilitaryFamily.org.